I really enjoy creating my own sentiments on the computer, if you haven't tried this yet I would recommend doing so. It's a great way to really express your own personality. Plus there are so many different fonts out there it can become addicting to collect them as well. And yes, I do love puns, I find them to be quirky :), kinda like me. And there is no better appeal than the background made from a Gel Press® print. It creates depth and interest in a snap, plus they are just so much fun to make. I like to keep lots of prints on hand just to have a stock of papers to choose from when I make cards. I dressed up this little gnome from the What's Up Gnomey? stamp set with some tiny pom pom ribbon. Altering stamps is another thing I like to do. I used a mask to block out the flower he was holding, made my own little paint brush and cut it out and then stuck it in his hand. This really helps tie in the image to the wording. Here's to great things in your future! if used properly they will only glisten. I love a hand held fan, and I have quite a few of them but I usually forget to carry them with me. Which is a shame cause I really need one as I just get so darn hot.all.the.time. where is the charm in that? So one of my fans is a touristy fan, nothing special or even pretty about it and I decided to re-paint it. I wish I had taken a picture of it before to show you of it's "before" state but I forgot. Anyway, here it is with some black and pink distress paint on the front. And the back which I simply painted black. Both sides have a protective spray of varnish and it turned out real well. Now I carry mine just for the sake of cooling myself off a bit but did you that once upon a time there were "codes" or a secret language for fans? I used the first row of ingredients, the sequins, color blue and spray. The inspiration for my card today came from fellow Gel Press® designer Lea Cioci to use the plate to achieve a watercolor effect. The blue flower was created following her instructions and you can visit her post HERE. I also sprayed some Lindy's spray ink directly on my 3x5" Gel Press® plate to create a yummy background! It's full of shine and shimmer! Spray directly on to your plate and this way you can really control that spray blast! Then flip the plate over and press down on top of the card base. Look at all that shimmer! slang phrase (from an old British detergent commercial) used to express that something was quickly and easily done. I miss that show, I think I need to have a Friends marathon on Netflix, whose bringing the wine...chocolate? This is my latest installment of the Sundays with Sandee video, enjoy! Yesterday's card, the "Make Your Own Fireworks" was the first pull and today's card is the second pull or "ghost print" which are usually my favorites. I am really enjoying mono-printing with my Gel Press® plate directly onto the front of the card base. I stamped an image on the left side and then re-stamped the butterfly onto a sheet of "run-off paper", you know, the paper where you run your brayer onto after spreading your paint onto the plate. I then covered the butterfly with Faber-Castell Glass Bead Glitter gel to hide the seam, which it did an awesome job doing! What seam you ask? Well you can see that the stamp is a "side stamp" and it didn't have a full butterfly, so after stamping the image on my "run-off" paper and cutting it out, I then took a picture of it, reversed the image on my computer and printed it out and voila I had the other side. I then glued them together but you could see the seam so I covered it with the glass bead medium. I don't think you can even tell. Motivation is literally the desire to do things. It's the difference between waking up before dawn to pound the pavement and lazing around the house all day. It's the crucial element in setting and attaining goals—and research shows you can influence your own levels of motivation and self-control. So figure out what you want, power through the pain period, and start being who you want to be. So go on, make your own fireworks! I can't get enough of this combination, distress paints on my Gel Press™ plate. The way the Distress paints move around is extremely addicting to watch. Go on, ohhh and ahhh over this background just like you would if you were outside on the 4th of July watching fireworks. So who is the best at making their own light show? Fireflies or if you are from the south, we call them little darlings lightening bugs down here! What’s more magical than a firefly light show on a warm summer night? I used some of my PITT pens to color them in and a Micron to outline my drawing for emphasis. They are bioluminescent, meaning that they can produce their own light. 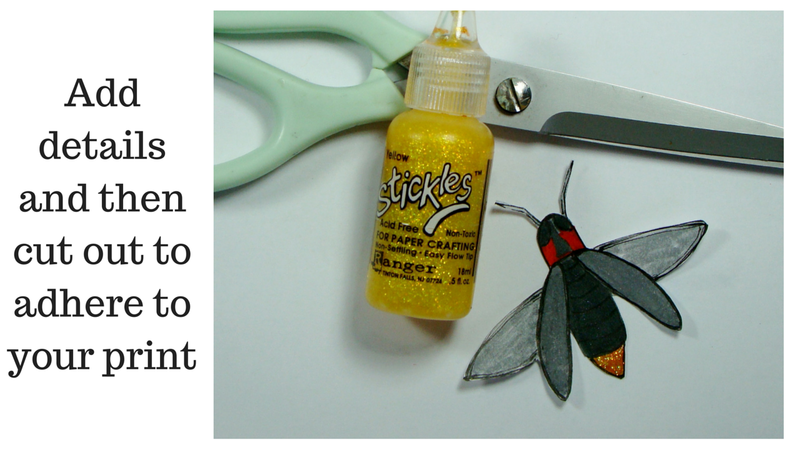 So I add some stickles to help their little light shimmer and shine! Then cut it out so I could adhere it to the front of my card. 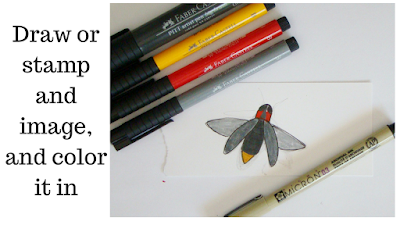 To help the firefly stand out from the background ( I mean, we all want to stand out, right? ) I outlined him with a white Signo...my favorite go to pen of all time. An interesting fact I learned about fireflies...only the ones along the east coast light up...now I wonder why that is? 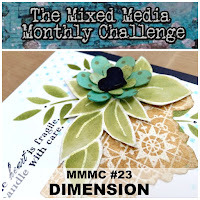 I also am crushing on this 3x5" size plate, just perfect for printing directly onto my card face. The most important thing to remember is to not place too much paint on it to get this effect. This is the first pull from the Gel Press™ plate. Next I stamped my whale and sentiment ( Paper Smooches - Surf and Turf stamp set ) on a separate piece of white cardstock and then cut them out to adhere to the front of the card. I colored them in with my trusty PITT pens. I will have a video up on my Youtube channel this Sunday under Sunday's with Sandee, hop over and subscribe now so you won't miss it. Joggles Woodcuts stencil, DecoArt Neon Light acrylics, along with my Gel Press™ plate made for a wonderful background for my images. I've always loved drawing mermaids and fairies. This little mermaid was cut from my Cricut out of my Gel Press™ prints. The background was carved out of corrugated cardboard. The seaweed was collaged with book print and then covered in gelatos. I love that they are sheer enough to let the print show throw yet still give a nice color. The ocean was painted using my DecoArt acrylic paints. I have come to embrace my handwriting and have learned 2 things. You need to focus on boldness and spacing and it usually works out fine. Her tail was covered with bead glitter, just love this stuff for sparkly dimension. "I just love mermaids. I was a mermaid in my past life. I just feel it when I go in the sea. I just feel a connection there between me, and the water, and the fish - they speak to me - and the shells - they ring out to me." So Simon says to shows pictures of your pet, and this is mine, her name is Daisy Mae, and no matter how much I tried to clear off my desk she found the one opening where the paintbrushes were!! She was not in a cooperating mood for being photographed with her sun hat today and kept throwing it off. I love going on vacation but I'm tired of the long drives to Florida so this was my last trip down there. In October I will be heading off to Myrtle Beach, SC for an "artcation" with my friend Tamiko, really looking forward to it! One of the things I was afraid I would miss is the Ditch Lilies blooming in my garden, but I got back in time to see this! While I was down there I picked up some Gator jerky for the maintenance guys who watered one plant while I was gone. I was afraid to ask them to do any more, after all it's not in their job description. Since I don't have any pictures from the dinner last night, I'll post a picture of my bear "Orsso Gellmello" where it is stationed out in front of Renzo's Ristorante in Hendersonville,NC. just wondering when the fame and fortune part kicks in! “Boho Chic” describes a style that includes flowy clothing, vintage and ethnic-inspired accessories, and natural-looking hair and makeup. The phrase became popular in 2002, when Australian journalist Laura Demasi used it to describe the eclectic gypsy look that was then in vogue.Although it’s been over 10 years since Demasi’s article, Boho Chic is still a popular style. and some SoSoft DecoArt Fabric Paint. I love my fabric paint for it's staying power through washes and for how soft it feels on your clothes! And YES! 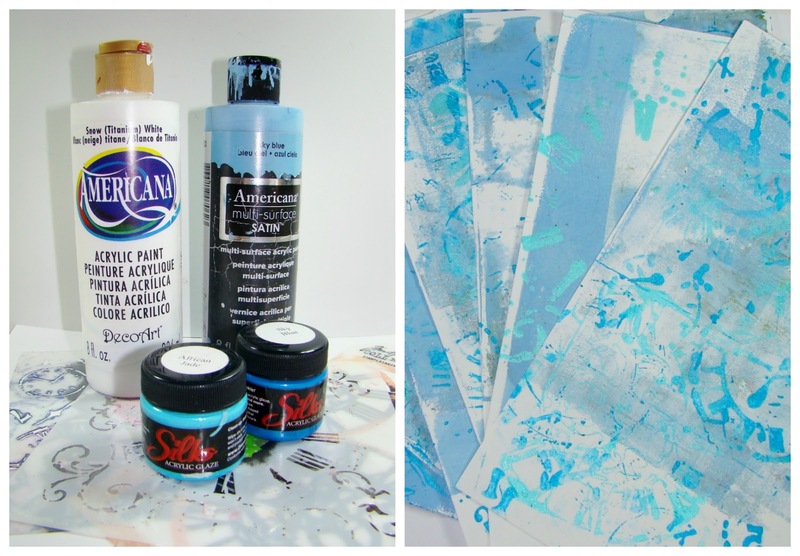 You can use fabric paint on your stencil, comes off just as easy as regular acrylic paint. Want to create a boho-chic look of your own? It's very easy and I have a very short video of how I made mine that you can watch HERE. And hey, if you like the video, could you give me a "thumbs Up"? I sure would appreciate it! 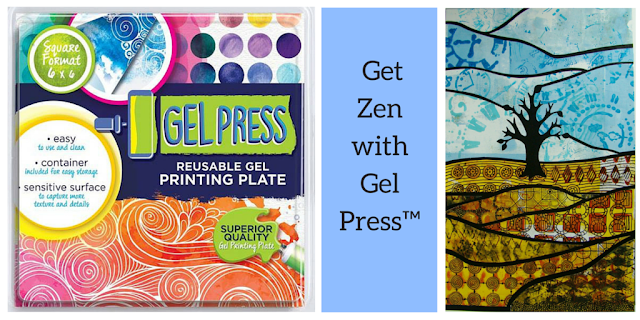 Welcome to the Gel Press™ Blog Hop featuring Zentangle inspired projects by all of our great creative team. Hop through all of the posts then go back to the GP Blog and leave a comment. One person 18 or over will win a Petite Set! Go to the Gel Press™ Junkie page on Facebook and share your Gel Press™ creations! 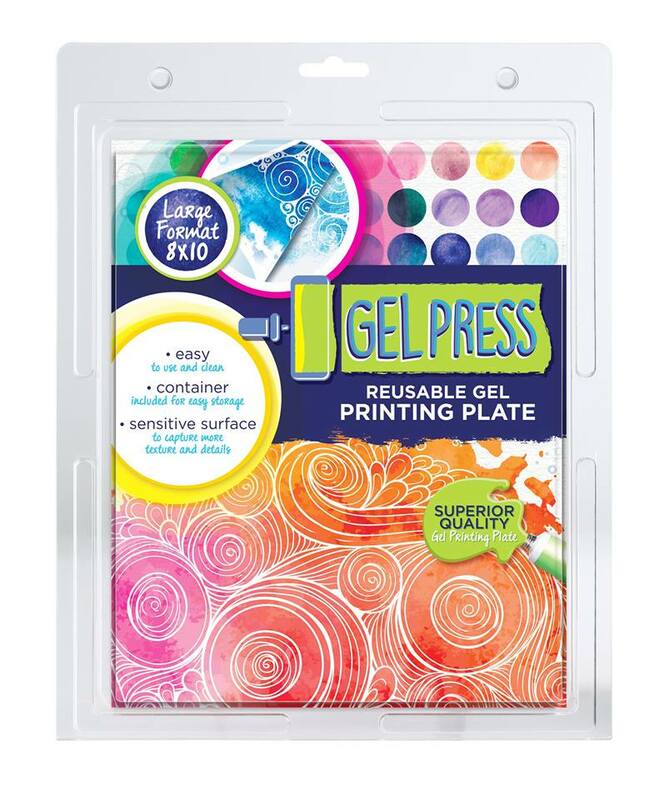 "LIKE" our product page for the latest news on All Things Gel Press™! 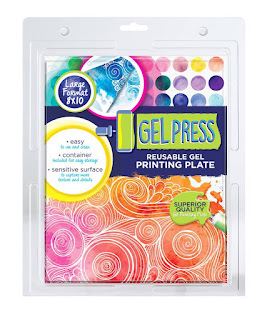 Each Gel Press™ print was created the same way, but with different color schemes and stencils. 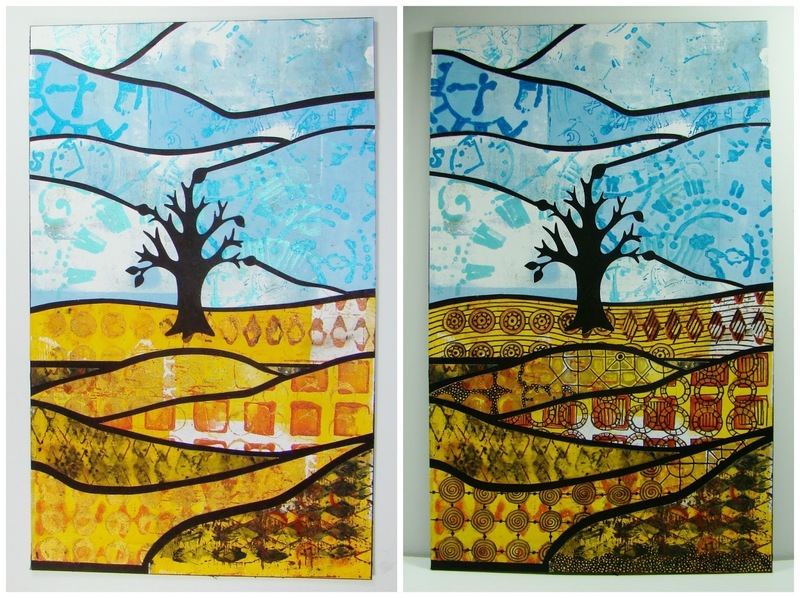 Each print began with a coat of acrylic paint first and then stencils with ColourArte Silks and Gelatos were used. After all my prints were made I cut them up and used them in a collage. The "earth" prints are all in warm colors and geometric shaped stencils. I did not use the gold gelato or the top stencil but sometimes I don't use everything I get out to inspire me. The "sky" prints are all in cool colors with time-related ( watches and clocks ) stencils. I did not end up using the white paint and just used the ghost prints since they had white areas already. I used the same tools for all the prints. 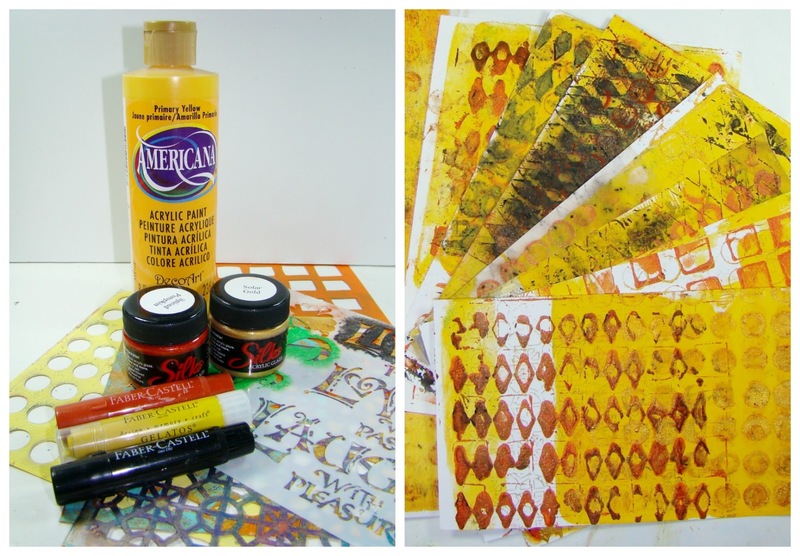 The brayer was used to spread the acrylic paint out and the spatula was used to apply the Silks through the stencils. Here is a side by side comparison of the prints before and after the Zen-doodling. And some close up shots. The tree was cut out on my Cricut ( Stretch Your Imagination, at 3½" ) from 5 different Gel Press™ prints and then reassembled onto the black mat board.